I have been teaching lessons over the internet using mp3s and now, videos. The most recent question was about how to improve tone quality for an advanced intermediate. This adult flutist sent several short mp3s of longtones, a piece, and a short Moyse melody, and I was able to ascertain that they were using a very dramatically tight embouchure that covered too much of the flute's blow hole. So I advocated a detailed plan of working with uncovering the blow hole (to 1/3 or so), keeping the flute's pressure low on the chin, and playing with a forward embouchure. There are at least 20 minutes of instructional mp3s sent privately to this student, but in an attempt to demonstrate "a loose forward embouchure for mp low longtones" I experimented with making an instructional video. "The Art of Playing the Flute" by Roger Mather for lowering the pressure of the lip plate on the chin. And as will be continued (I hope) in a second, future video, "Conditioning Training" by Werner Richter, which is aimed at advanced intermediates. Love it!! I'm an adult student starting my 4th year of study. One of the enduring mysteries for me has been where exactly the flute should be on my face to get the best result. Your demo makes this very clear. The forward embouchure is also working well for me. Very exciting!! THANK YOU!! Thanks for your comment, Dawn. 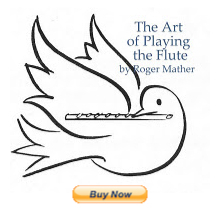 My information came from working with "The Art of the Flute" by Roger Mather.